In a medium saucepan combine freekeh, broth, turmeric and ½ teaspoon salt. Bring to a boil, cover and reduce the heat to simmer gently until freekeh is tender, about 20 minutes. Set aside. In a medium bowl whisk together lemon juice, olive oil, garlic and ¼ teaspoon salt. Add kale and massage until slightly wilted. In a medium saucepan filled with water, add vinegar and bring to a simmer. Crack eggs into 4 ramekins or small bowls. Slip one egg at a time into water and cook until whites are set but yolks are still runny, about 3-4 minutes. Remove eggs with a slotted spoon and allow to drain briefly. Repeat with remaining eggs. 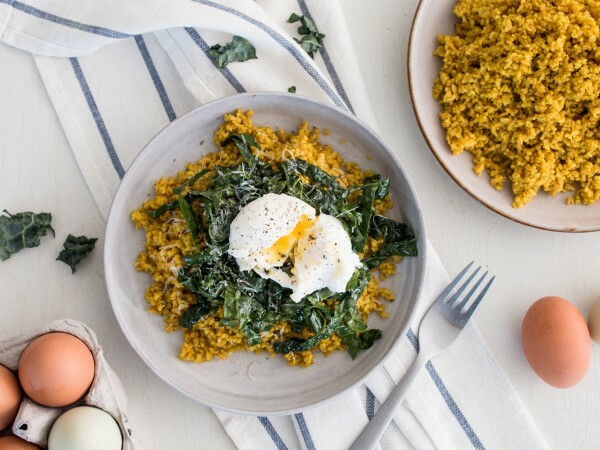 Divide freekeh between bowls and top with kale salad, poached eggs and Parmesan.